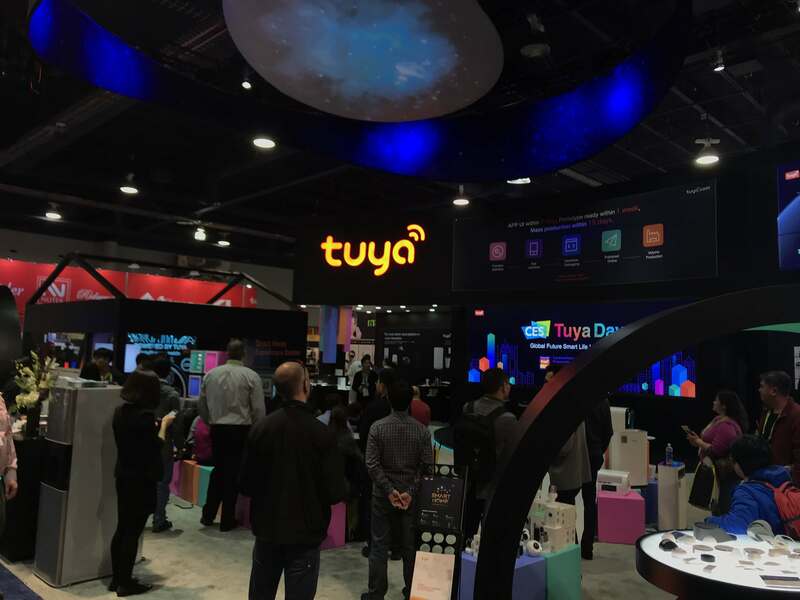 LAS VEGAS, Jan. 11, 2018 /PRNewswire/ -- On January 10, 2018, Tuya Smart, a China-based provider of IoT platform, announced their fully upgraded IoT platform at CES 2018, the annual tech extravaganza that kicked off in Las Vegas on January 9. The efficient and low-cost global system enables manufacturers to rapidly upgrade their products by providing them with AI services, including hardware access, cloud services and app software development. In addition, Tuya Smart has recently rolled out its international website www.tuya.com. Tuya Smart, a Chinese technology startup that was founded just three years ago, is showcasing hundreds of smart products across six broad categories within its 1,950 square-foot (180 sq. meters) booth at the exhibition, including lighting, electrical engineering, electrical household appliances, smart kitchen appliances, environmental health and security cameras. The company's exhibits also include several futuristic tech products, among them mesh lamp arrays and AI cameras in addition to its smart home experience zone, all of which have caught the eye of visitors. A long development cycle that typically lasts six months to one year and R&D costs that can reach several hundreds of thousands of dollars. The substantially higher level of complexity in the development process and product incompatibility: manufacturers have a lot of difficulty in being able to guarantee product compatibility as they need to work with several suppliers to intelligentize their products. Difficulties in expanding into international markets: manufacturers can miss the opportunity to expand outside of their domestic market if their suppliers fail to provide cloud services with worldwide reach. Tuya Smart neatly solves these challenges for traditional manufacturers with its newly released, fully upgraded IoT platform. The launch of the English-language version of the system has demonstrated the company's competence in empowering global manufacturers with AI. Citing an example, with the Tuya Smart platform, manufacturers of lighting products, including sockets, switches and lamps, can complete the transformation of their traditional products into smart ones within just one day and put the smart products into mass production within 15 days. The combination of internet-connected modules, cloud services and apps allows for simple and efficient development of smart products. Tuya Smart has supplied AI services covering a wide spectrum of home appliances to over 10,000 customers in nearly 200 countries and regions worldwide, assisting them in upgrading nearly 11,000 products in the aggregate and creating such popular smart items as the Ar4 smart AI monitor, the DoorCam wireless security camera, the Blink video doorbell and the Lancey electric heater. Notably, Tuya Smart has established relationships with leading smart speaker brands from around the world, including Amazon Echo, Google Home, Tmall Genie and Rokid. "Tuya Smart, with its global IoT platform, has already empowered many firms with AI functionalities and plans to provide AI services to manufacturers in the USA and around the world, allowing them to intelligentize their products in a barrier-free manner," said Tuya Smart CEO Jerry Wong. "In addition to helping enterprises upgrade products with smart technologies, the company also plans to fully empower manufacturers by providing them with AI services that expand the breadth of their marketing channels, supply energy-saving solutions and reduce supply chain costs as well as furnish aftersales and personalized services, with the goal of fulfilling its vision of a worldwide transformation of consumer electronics and the internet of everything."